Does EPUB support XHTML "pre" elements? Yes. EPUB 3.1 does support XHTML "pre" elements. 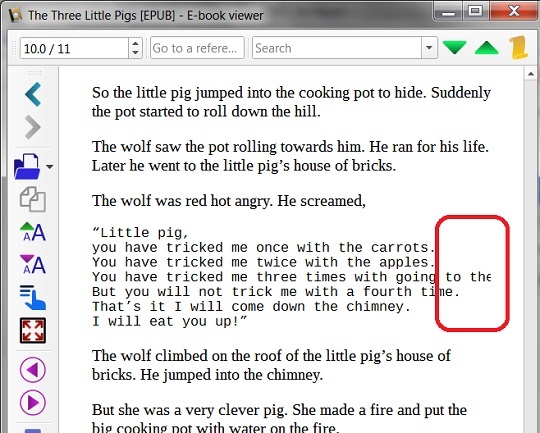 EPUB readers will display "pre" elements with a monospace font. Text lines within "pre" elements will be displayed without wrapping. So if you have long lines in "pre" elements, text will be truncated on the right side. you have tricked me once with the carrots. You have tricked me twice with the apples. You have tricked me three times with going to the fair. But you will not trick me with a fourth time. That’s it I will come down the chimney. ZIP all files together to created 3Pigs6-3.1.epub.